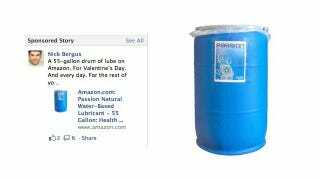 A 55-gallon tub of lube is funny. That's just science. But when you post to Facebook about it being a funny thing that exists in the world, there's a chance that your post might get turned into an ad for that specific lifetime supply of hand love enabler, visible to everyone you know. Other people start reporting that they're seeing it, too. A fellow roller derby referee. A former employee of a magazine I still write for. My co-worker's wife. They're not seeing just once, but regularly. Said one friend: "It has shown up as one on mine every single time I log in."